These stories, which originally appeared in The New Yorker between 1969 and 2010, are vivid portraits of lives cut short. An upstanding farmer in Iowa finds himself drastically changed by a woman he meets in a cocktail lounge. An eccentric old man in Eastern Kentucky is enraged by the presence of a documentary filmmaker. Two women move to a bucolic Virginia county to find peace, only to end up at war over a shared road. Mexican American families in California hand down a feud from generation to generation. A high-living criminal-defense lawyer in Miami acquires any number of enemies capable of killing him. 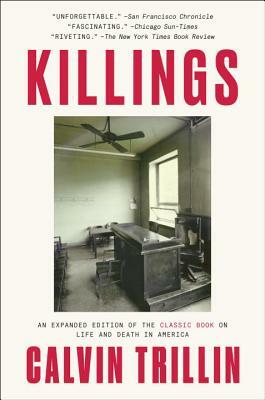 Stark and compassionate, deeply observed and beautifully written, Killings is “that rarity, reportage as art” (William Geist, The New York Times Book Review). Calvin Trillin has been a staff writer at The New Yorker since 1963. His nonfiction includes Jackson, 1964; About Alice; and Remembering Denny. His humor writing includes books of political verse, comic novels, books on eating, and, most recently, a children’s poetry collection illustrated by Roz Chast, No Fair! No Fair!